The Daily News: Got milk...? We didn't cry over spilled milk. We simply didn't have time to cry. It was an all hands on deck fast and furious response. More on that fiasco later. First, let's jump into the Time Machine and rewind 13 years to Year 2004. That's when we washed ashore on The East Fork of The Salmon River at Bowery Guard Station in Idaho's Sawtooth National Recreation Area. We knew no one and were the proverbial strangers in a strange land. Almost immediately however, we were “adopted” by local legends from The Hurless Family. Clayton, Curt, Lisa and Dana became instant Dear Friends and the foundations of our happy and successful four seasons at Bowery deep in the Heart of Custer County. Ten years ago Clayton, The Hurless Family Patriarch, asked us to create a website for The Family's Old Sawmill Station, a vibrant cultural outpost at Hwy 75 Milepost 218.5 alongside the free-flowing Salmon River. Even though we moved to Idaho Falls in late August 2007, we kept in contact with our Dear Friends at Old Sawmill. Periodically, Clayton would pay us a handsome sum to update the website. Clayton was like a surrogate father-figure to me. My own Dad died in 1998. Clayton so much reminded my of my Dad. I so enjoyed his company. The last time I saw Clayton was in May 2015, not long before he died on August 15 that year. 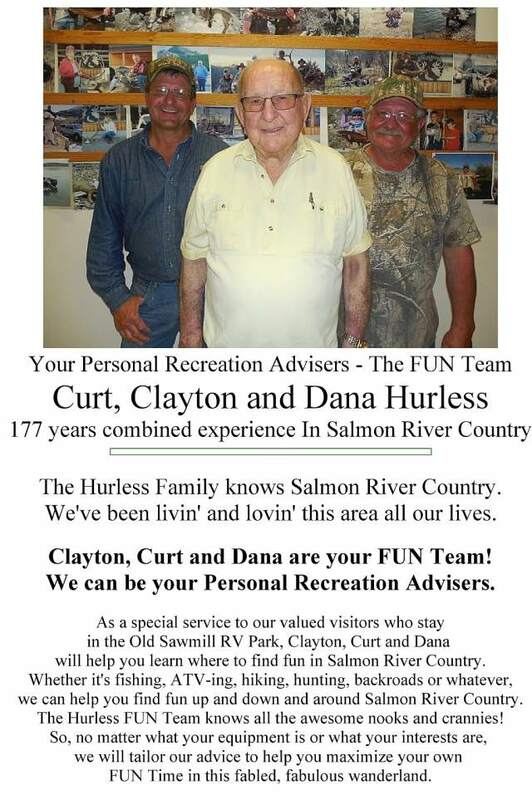 We did some tweaking of the website and took a fabulous photo of Clayton with two of beloved sons, Curt and Dana. Once again Clayton overpaid us for the trivial work we did. After Clayton passed on, we blew that photo up to poster size and sent it to The Family where it now hangs framed in a place of honor at Old Sawmill Station. We never heard a word back about the website from The Family after Clayton's death. Meanwhile in May 2016, Go Daddy dinged me $100 to renew the “oldsawmillstationidaho.com” domain name. I really didn't want to pay that hundred bucks but I did so out of respect for Clayton and his Family. I didn't let them know I paid for the website's renewal. Clayton had always been so generous with me, I felt it was the least I could do for his memory. Meanwhile, time passed. By and by, Lisa Hurless “found me” on Facebook in August 2017. She sent a Friend request which I quickly confirmed. By and by, Lisa asked if there was any way I could help them update the website. Well, Clayton took all the passwords with him when he departed. So I told Lisa I didn't think there was anything I could do. Meanwhile, in the middle of a dark summer night, I remembered the password to the Gmail account I had created for Clayton, oh so long ago. Strange but true. I woke up and hurriedly tried the password and, VOILA, it worked! Well, that opened up all sorts of doors. And then, as if by magic, I found a sheet of paper that contained the logon and password info to the server housing the Old Sawmill website! Lisa had offered to reimburse me for the $100 I spent. Instead, I told her we would come up to Old Sawmill if she would pay our round trip gas, give us free camping and all the free hamburgers we could eat. 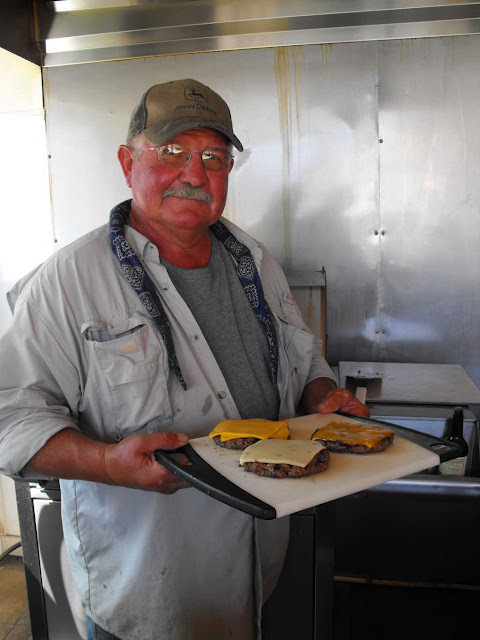 You see, Old Sawmill has The Best Burgers on The Salmon River between Stanley and North Fork. They aren't pretentious concoctions such as you might find at Jerome's Haunted Hamburger. Nope. They are big, fat, classic American hamburgers hand pattied the old fashioned way and grilled on a real grill by Dana, The Master Griller. Lisa quickly agreed to our proposal. Meanwhile, we worked with CTCI in Challis to verify access to the server. We also bought some HTML editing software and updated our FTP software. We then created a blog and a Facebook for Old Sawmill as well. Everybody needs a blog, right? The first post (and so far only) post on the blog is a verbatim reproduction of Clayton's obituary. I provided that photo to the mortuary when Clayton died. I cropped it from the photo of him with his sons. Anyway, Lisa and we set a date to appear at Old Sawmill. The plan was to arrive the day after Labor Day and stay three nights while we would work with The Family to edit the website according to their wishes. Meanwhile, Dear Friend Heather let us know she would be out at her Dream Ranch on The East Fork late on Labor Day weekend. Ah, HA! We immediately saw a chance to get Double Duty out of our pre-planned trip to Old Sawmill. Heather and her Friends would be staging for a Middle Fork River trip. Heather planned a Big Party Labor Day and said, “Come on out!” Naturally, we agreed and began rigging the travel trailer and our stuff to wind up at Heather's Place about 5 pm on Labor Day. Everything was going smoothly according to plan on Labor Day. We envisioned leaving by 1 PM and, sure enough, we buttoned up the house and drove away a few minutes before the stroke of one. Well, by then it was too late. We hurriedly whipped off onto a side street and our worst fears were confirmed. An unopened gallon of milk had ruptured when it fell from the fridge, spilling the full gallon into the small floor of the trailer. Meanwhile, a larger container of three-bean salad went feral on the floor and a giant container of spaghetti and sauce did a face plant as well. It was an epic mess. We jumped in the truck and beat feet back home, a few blocks away. We pulled willy nilly into the back yard and began frantically emptying out the trailer and it's three side compartments. We didn't cry over spilled milk. We might have cried but we simply didn't have time for emotions. Spilled milk is a smelly disaster-in-the-making. It took us two hours to fully empty the trailer and another three hours to attack the full extent of the spilled milk. All totaled, we spent over six hours on the cleanup. Yes, Labor Day truly turned into a Day of Labor for us. The tide turned when we had the inspiration to use an air compressor to force antibacterial chemicals into every little crevice were the milk went. It as a time-consuming and very tedious job. Of course, there certainly wasn't any way that we'd be going to Heather's Party at The Dream Ranch! As dusk began to form, we were completely exhausted and wondered what tomorrow might bring. Luckily, our immediate and aggressive attack on the spilled milk did the trick. We woke up Tuesday morning and tip-toed out into the trailer. Nary a scent of the stench of spilled, spoiled milk could be smelled. Oh, joy! And thus began the lengthy, complete repacking of the trailer's contents. Fortunately, it only took a few hours and we were able to drive away again slightly before the stroke of 1 PM. Oh, what a 24 hours transpired between those two deja vu departures. We had an uneventful drive out US 20 to Arco and up US 93 to Challis. 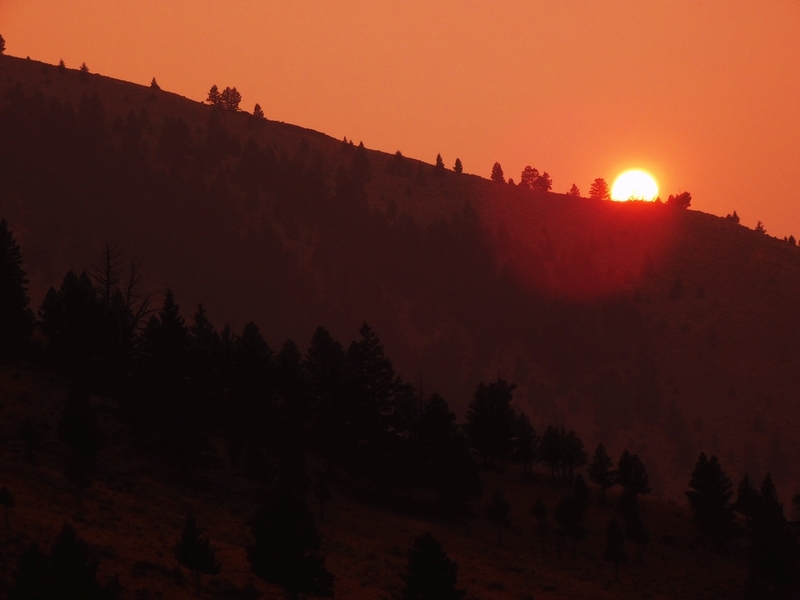 Dense smoke from the scores of sprawling western wild fires blotted out every land mark of that scenic drive. 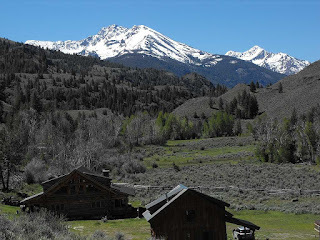 The towering Lost River Range was completely invisible! Visibility was adequate to see oncoming traffic but that was about the extent of our vision. We rolled into Challis shortly after 3:30 PM and hurried to The HUB, a mecca of sorts for us. Luckily, The HUB was open until 4 PM and we scurried inside searching for some of The HUB's legendary, famous fifty cent deals. Susun found four fabulous skirts for 50 cents each and I scored a nice Nike golf shirt and a new, never-worn hat for 50 cents apiece. Ah, The HUB! Let us count the many ways we love your 50 cent deals! After leaving The HUB at 4, we went to CusterTel to meet with Louanne. She's the person in charge of the server that hosts the Old Sawmill website. She assured us she would be on stand by in case we ran into any technical problems transferring files to update the website. And then we drove out on Memory Lane, heading upriver on Idaho 75, The Salmon River Scenic Byway. We long ago lost count of how many times we've driven that iconic road. But each time is unique and Tuesday was no exception. The dense smoke turned the foreground horizons into ghostly, craggy, bluish apparitions. 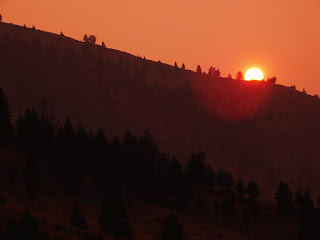 The smoke created new stark vistas giving us fresh perspectives about this land we thought we knew so well. We passed by all the familiar places, The Buffalo Jump, The Bighorn Sheep area, the mini gorge, Bayhorse, Tunnel Rock, Dead Man Hole, Broken Wing Ranch, the stone quarry, Clayton (Population 7); Ice Corner and finally arrived at Old Sawmill shortly before 5 PM. It felt like coming home, pulling into such a familiar and welcoming place. Dana was outside with a brew on the deck chatting with a Friend in an ATV. He welcomed us as if we had just left yesterday for an errand in Challis. We gave him a special hat with a stuffed fabric trout embedded in the ball cap. Dana was pleased. He's going to wear it to his Challis High School Class Reunion this coming weekend. Dana took us out to the RV area behind Old Sawmill and showed us where to park. Then we went inside to exchange hugs with Dana's wife, Lisa and Dana's Mom, Deanie. It's always so wonderful to see their smiling happy faces. We talked briefly about our Wednesday morning game plan to begin work on the website about 10 AM. And then it was time to set up our tiny home, The Mosey Inn, in Site #29. We were happy to learn Old Sawmill's WIFI doesn't reach our campsite. Ah, the joy of a grid free camp! 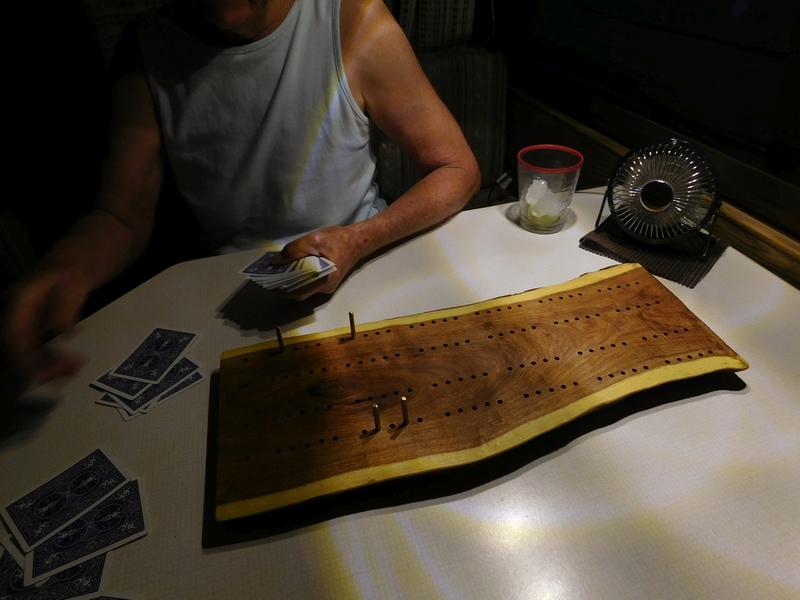 The big highlight of our first night's camp was christening the new cribbage board. We played six games on it and both loved it. 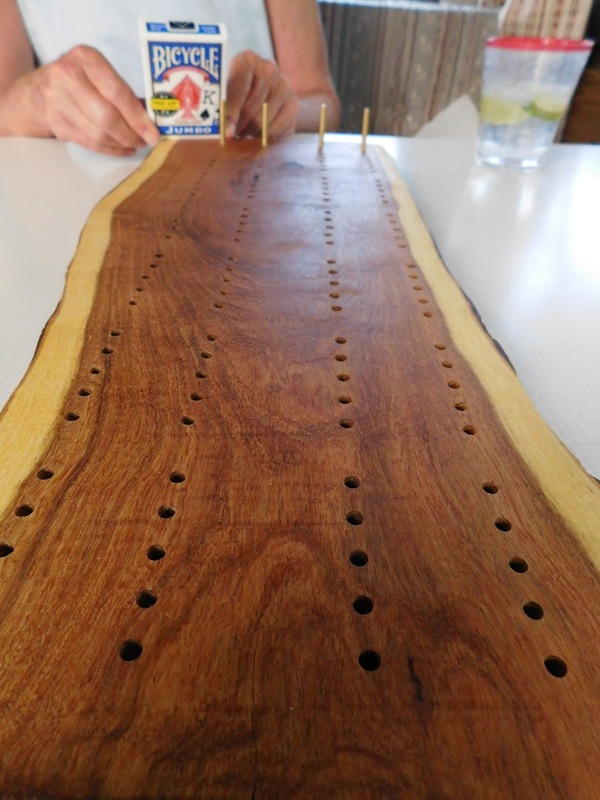 The board is made from a thick slab of mesquite purchased on Leap Year Day 2016 from the Tumacacori Mesquite Sawmill. Yes, it was kind of ironic that the mesquite came from one Old Sawmill to another Old Sawmill! By and by, we both fell into a deep slumber beneath the smoke filled skies of Salmon River Country. It's great to be back. Well, we've worked form 10 AM to 4:15 PM non-stop today so I guess it's time to take a break.